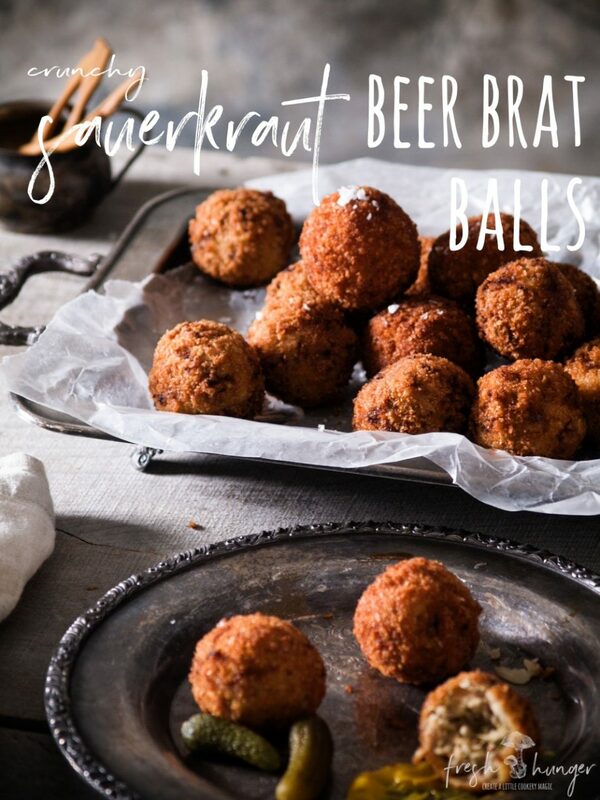 If your planning any sort of get together soon, you need to make these Beer Brat Sauerkraut Balls. Crunchy & a little different than the usual appys served, these are perfect with some ice-cold beers or your favorite cocktail? 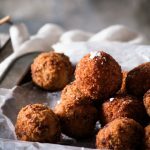 Relatively easy to make, these German-inspired balls use pork beer brats, mustard, onion, melted Swiss cheese, fresh parsley & sauerkraut – rolled into balls then into panko breadcrumbs & fried until deep golden-brown & uber crunchy. These little crispy balls are completely addictive. And, if by some miracle there’s leftovers, they’re also really good to snack on cold. You might have a preference for sauerkraut. We tried these with a few different kinds – in a bag from the refrigerator section, in a jar & a can. Really, when the kraut is mixed with the other ingredients & cooked, you can’t notice a different, do use what you prefer, just a word though, it does need to be drained thoroughly & quite finely sliced. If it looks a little chunky then give it a quick chop. Otherwise, just use it as-is. Prep them ahead of time so all you have to do is cook them when your guests arrive. Then serve them simply with some yellow mustard (mild or hot, take your pick) & some cornichons. That’s all they need to be THE hit of your next get together. 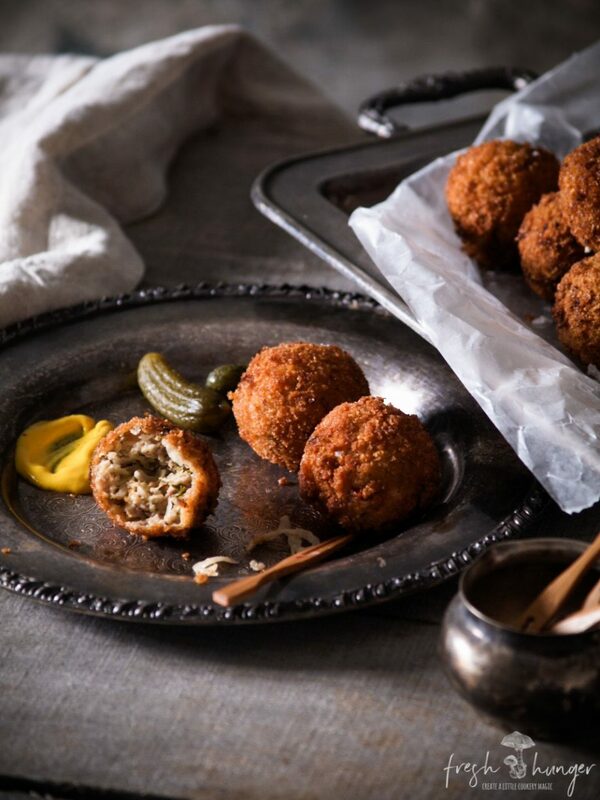 These crunchy little morsels are going to be the hit of your next get-together. They’re so delicious & easy to make. Plus, they can be prepared & breaded a day ahead & cooked just before serving. Remove from the fridge 30 minutes before you cook & make sure your oil is the correct temp so the balls cook thoroughly without over-browning. Drain sauerkraut in a colander. Then, place in the center of a clean, dry tea towel. Pull the sides of the towel up & twist it, squeezing as much liquid from it as possible from the sauerkraut. Or, grab fistfuls of the kraut & squeeze it to remove the liquid. Leave to drain further in the colander. Split each brat down the center & peel off casing, dropping the insides into a large bowl. Add 1/4 cup of breadcrumbs, onion, parsley, mustard, garlic, cheese, salt & pepper. Stir until all ingredients are thoroughly combined – using your hands works best for this – it’s important to ensure the mixture is thoroughly combined. Cover a baking sheet with parchment or waxed paper. Roll mixture into 2 tablespoon balls. Whisk eggs & milk in a medium, shallow dish until combined. Place flour in another shallow dish; season generously with salt & pepper. Add remaining breadcrumbs to a third dish. Gently toss each ball lightly into flour then dip into egg mixture, draining away excess egg. Roll in breadcrumbs & place back on the baking sheet. Heat oil in a wok or large saucepan until it reaches 350F. 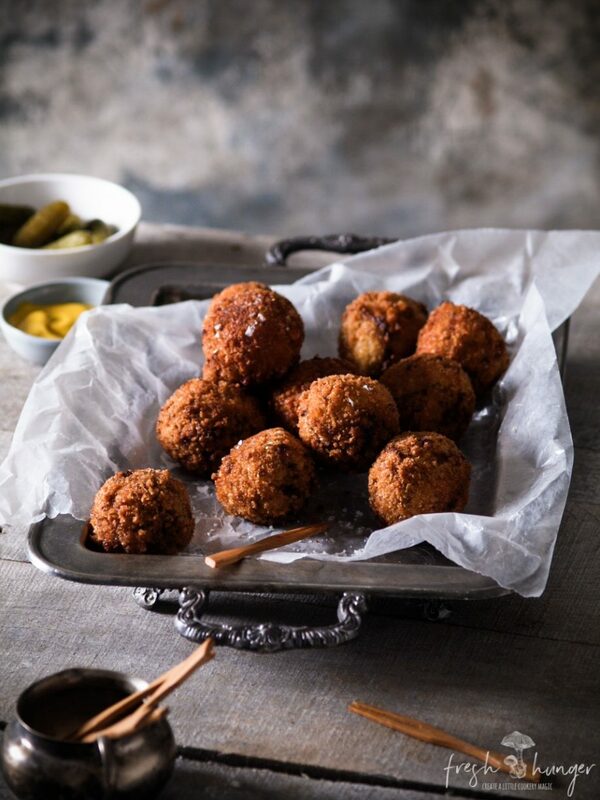 Cook the balls in 4 to 5 batches for 6 minutes or until a deep golden brown & cooked through. Drain on paper towel & keep warm in the oven until ready to serve. Makes about 24. Serve with mustard & cornichons, if desired. Looking for some other tasty appetizers? What about Spinach & Walnut Palmiers, Thai Fish Cakes or Salt & Pepper Calamari.